Our Lady has spoken and given instruction to Ivan about today’s family and the youth and those things that hurt and attack them. In one interview, Ivan stated that Our Lady has asked him to write a book, with Her help, about the disease of materialism, which he says is destroying the beauty of God’s people and the world that He created. The book, he said, will be released “as soon as the Blessed Mother says.” 5 Interestingly enough, Ivan married an American girl from Massachusetts, Laureen Murphy, who is a former Miss Massachusetts. 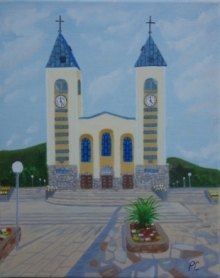 Laureen experienced conversion through Medjugorje, which eventually led to her meeting Ivan. Since their marriage, Ivan lives with his wife and children half of the year in the United States and half the year in Medjugorje. Living within the culture of America has, no doubt, given Ivan a greater understanding of the evils of materialism than if he had remained within the region and culture in which he was born. Through the direction of Our Lady, Ivan, with Marija, started a prayer group of young people, who began meeting twice a week on Apparition Hill or Cross Mountain. During the prayer group meetings, Our Lady would normally appear to the visionaries giving messages and instructions. She asked them to offer their prayers for the fulfillment of her plans for the world. Although most refer to the prayer group as “Ivan’s prayer group,” Ivan states that it is Our Lady who is the leader of the group. Tens of thousands, if not millions of pilgrims have joined this small prayer group up on the mountains throughout the years. It is a great joy of Our Lady to see so many come. As in the message below, She has often stated how happy She is to see everyone gathered in such large numbers.